Lydia Copeland Gwyn's stories and poems have appeared in New World Writing, Gone Lawn, the Jellyfish Review, Appalachian Heritage, Elm Leaves Journal, the Florida Review, Glimmer Train, and elsewhere. She has received several Pushcart Prize nominations, was a finalist for the Best Small Fictions, and has placed in the Wigleaf Top 50 three times. 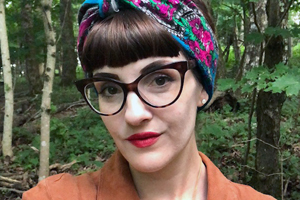 She was also a finalist for Glimmer Train's Flash Fiction Award, and her chapbook "In the Air a Shining Heart" placed second for the Florida Review's Jeanne Leiby Memorial Chapbook Award. She lives in East Tennessee with her husband, son, and daughter.